One of the best things about summer is that wonderful, fresh organic fruit literally grows on trees! Fruit trees are such a great investment. Although they do take some work (think picking up hundreds of smashed peaches in your yard after a wind storm, or scraping baked-on apricot off your driveway with a snow shovel) fruit trees are well worth the effort. A mature fruit tree will produce many pounds of fruit every year, often enough for you to can, freeze, dehydrate, and give away…even after you’ve enjoyed eating a ton of fresh, delicious fruit fresh off the tree! Nothing is better than fruit ripened in the sun, eaten minutes after it’s been picked. We’re visiting family this week, and have access to a beautiful cherry tree. After dragging out some ladders, securing a few large containers, and climbing up as high as we could get, the girls and I enjoyed about an hour of cherry picking. It’s hot, sticky work…but fun, too. You feel a little like Laura Ingalls, putting fruit away for the winter. I kind of wished that we had been wearing sun bonnets! Sunbonnets aside, we did get quite a few fresh cherries this afternoon. The hard part was trying to pick a recipe in which to use them! There are so many great cherry recipes to choose from, it took some time to narrow it down. We finally decided to try something unconventional: Cherry Compote over Goat Cheese (found at myrecipes.com). A fresh, delicious appetizer that was wonderful with a few crackers, light enough to be enjoyed right before dinner. Cherries, brown sugar (honey or rapadura would also work well), fresh thyme, and a little organic balsamic vinegar are all that goes in the compote. Spoon it over some fresh organic goat cheese (or homemade yogurt cheese…yum!) and serve with crackers. A simple but elegant treat, easy to make after a long hot day outside! The recipe calls for three cups of fresh cherries, but I found that we had quite a bit of compote left over. This would be amazing over ice cream, on yogurt, or in a smoothie as well. There’s not much vinegar in it, so it’s very easy to use it as a dessert if you don’t use it all on the cheese. What a fun way to use fresh cherries! You wont believe the incredible flavor combination that is this delicious cherry compote over goat cheese. So good! Adapted from this recipe. Wash and pit the cherries. Cook them over medium heat with the sugar or honey, stirring occasionally, for about 4 minutes. Sprinkle in the thyme and vinegar, and cook for one more minute. Spoon over fresh goat or yogurt cheese. Serve with crackers. 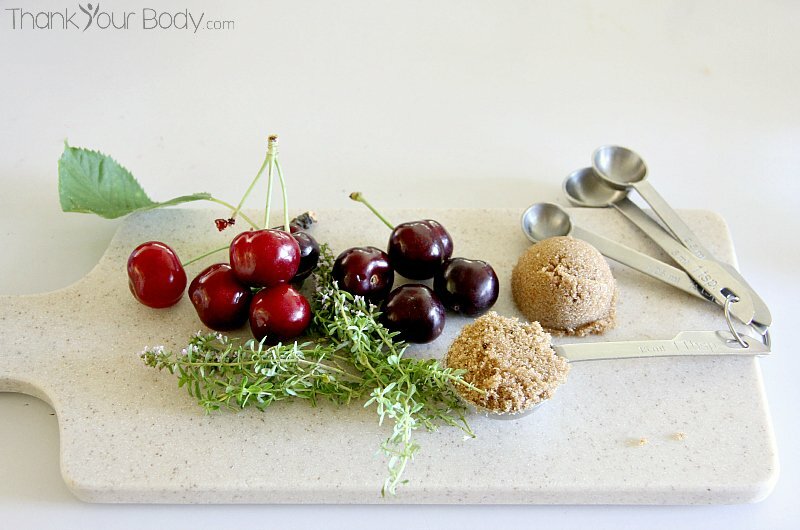 Do you have any fun cherry recipes to share?